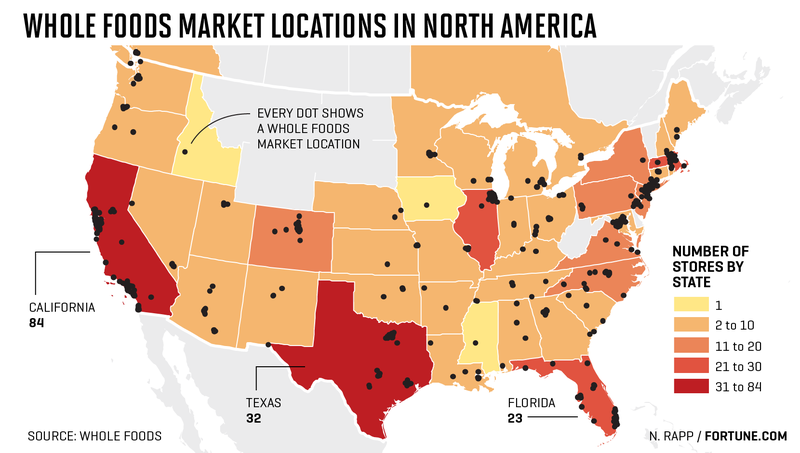 This is the 5th article in a series covering the reach of online grocery retailers in the US. Past articles covered Walmart, Kroger, Instacart (all retailers), and Target (Shipt). Basketful makes Add to Cart solutions for online grocery. We regularly study where consumers are, where brands are (distribution, availability), and where retailers provide services. We found that Amazon Fresh can currently reach 18% of the US population. Here are some other large retailers we’ve covered, for context. Amazon Fresh launched over 10 years ago in Seattle, and in 2013 Bezos identified the reason for slow expansion was figuring out “how to make it make financial sense“. After acquiring over 450 Whole Foods stores and rumors of acquiring former Toys R Us locations, they seem to have figured it out. Fresh will fold underneath Prime Now. VP Stephenie Landry discouraged this notion* (and here) when she picked up responsibility for Fresh (in addition to Prime Now), but from a bottom line perspective we can’t make an argument to keep them separate. To be clear, the brand will live, but the underlying platform will fold under Prime Now. Amazon Fresh/Prime Now will invest in local real estate for warehouses and pick-up locations. Delivery is expensive, and customer pickup offers the right balance of price and time savings for an expanding consumer base. Amazon will pioneer another new store format. We think the center store will move to a warehouse and the store floor will be almost entirely higher consideration goods, impulse purchases, and promotions. At pickup you’ll be greeted with visit specific personalized deals you can add to your order, or head inside to find more deals. When you head inside the things you pickup (including that produce you’re so picky about) are added to your order in an Amazon Go type experience. When you’re done you head back to your car where the friendly attendants have already loaded the rest of your groceries. Ok, #3 might take a bit more than 18 months. One thing is certain: Amazon doesn’t plan on being out-innovated. We love the innovation Amazon is bringing to grocery, but do not underestimate the headwinds they face with challenging margins, competition that is more competent than the press would imply, and the time/cost it takes to build reach. Got a different take? We’d love to hear it. * Fortune calls Landry a “rising star”. She was an intern in 2003. In 15 years she was in logistics, transportation, supply chain, customer service, warehousing, and new product development. She has run Prime Now for 4 years. She just picked up Fresh. Landry is undeniably a full-fledged star at this point.